The neutral player does not get any victory points, but he is present on the Doge track, he competes for the stage bonuses in phase II, and he places councilmen in the districts. We recommend playing by the standard rules a few times before trying out this variant. The neutral player (NP) is the starting player. Randomly determine who will be sitting to the left of the NP. This player gets 1 gold coin, the other player gets 2 coins. Lay out 3 card rows. The NP starts with all of his councilmen in his personal supply. Leave some space on the table for his cards. The NP does not get any victory points, nor coins, nor does he build buildings. However, he has a counter on the Doge track. 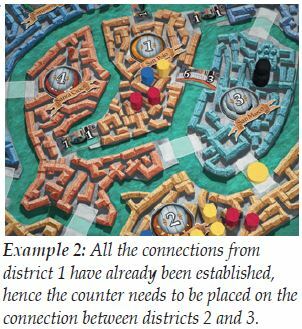 The NP uses his other counter to mark the connection between district 1 and the adjacent district with the lowest number. The counter indicates where the NP will build a bridge or gondola if he gets the corresponding bonus in stages D or E of phase II. The players may choose to build a bridge or gondola on the marked connection. 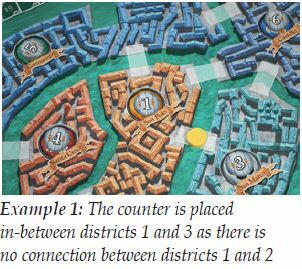 When a tile has been placed on the marked connection, a new one has to be marked: Determine the district with the lowest number that has at least one free connection left. Among the free connections, choose the connection pointing to the district with the lowest number. Place the counter there (see ex. 2). After both players have completed phase I, draw 7 cards for the NP and turn them face-up. Sort the cards by type in the order A - F, adding all Jokers to the Councilman cards (F). D Bridge: (only if he gets the bonus, otherwise no action): Place the bridge on the marked connection such that the lower number points to the district with the lower round number. Then move the counter to the next eligible connection according to the rules above. E Gondola: (only if he gets the bonus, otherwise no action): Place the gondola on the marked connection. The NP puts 1 councilman each in both adjacent districts. Then move the counter to the next eligible connection according to the rules above. F Councilman: The NP places councilmen into the current district as usual, thus, influencing the final scoring. The NP has an infinite number of councilmen. If he runs out of them, just use the councilmen of another unused color instead. Stage E/F: If the NP fulfills the requirements for the district bonus, turn the bonus tile face down. In phase III, the NP does not carry out any actions.